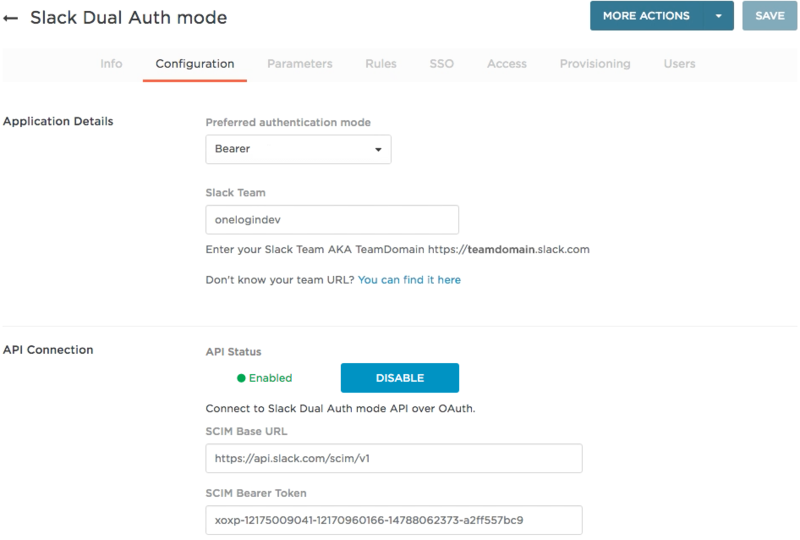 This article describes how to provision users from OneLogin to Slack using the Slack SCIM API. Note: User provisioning via the Slack SCIM API requires a subscription to the OneLogin Unlimited plan. Contact OneLogin Sales for more details. Go to Apps > Company Apps and select the Slack app to which you want to provision users. The Slack Team should already have been entered when you set up SSO for Slack. Important! If you used the Slack SAML connector to add the SAML app to your OneLogin App Catalog before Sept 9, 2016, your Configuration tab will look a little different than this, because Slack now lets you use OAuth 2.0 authentication without having to use a SCIM bearer token. Pure OAuth authentication is more secure, and you should switch your Slack API connection to use OAuth only. For upgrade instructions, see Upgrading Slack API authentication to OAuth. Connect to the Slack SCIM API over OAuth. Click Authenticate and follow the prompts to enter your Slack credentials over OAuth 2.0. These credentials must have permissions to read and write to your Slack account using the Slack SCIM API. Select Enable provisioning for Slack. Once you enable this option and give users access to the app, the provisioning process will begin. Note: You must select this option now to enable options required to complete subsequent steps. To ensure that you do not inadvertently provision users to Slack before you are ready, enable the action controls described in the next step. Enabling these action options is useful especially before you intend to start provisioning because with the Enable provisioning for Slack option selected, you may just trigger provisioning during the course of setup and testing. With this safeguard enabled, a OneLogin administrator can just choose to ignore any inadvertent provisionings. Once you are done configuring and testing provisioning, you can update the settings to leave one or more action options clear if you want OneLogin to make the provisioning change in Slack without requiring administrative approval. Select what happens to a user in Slack when that user is deleted from OneLogin. Select Delete, Suspend, or Do Nothing. In this task, you'll map Slack user attributes to OneLogin user attributes. Attributes are split between required and optional; you can select which values you want to include or exclude. These mappings tell OneLogin how to populate user attribute values to Slack when provisioning users from OneLogin. If you have a OneLogin attribute value that you want to send over to populate a Slack field, you'll define it in this task. Use the Groups parameter to provision users to Slack user groups using the Slack SCIM API. Groups provisioning is performed using safe entitlements. If you want to provision all of your users to one or more existing Slack user groups, configure provisioning using the Groups parameter alone. 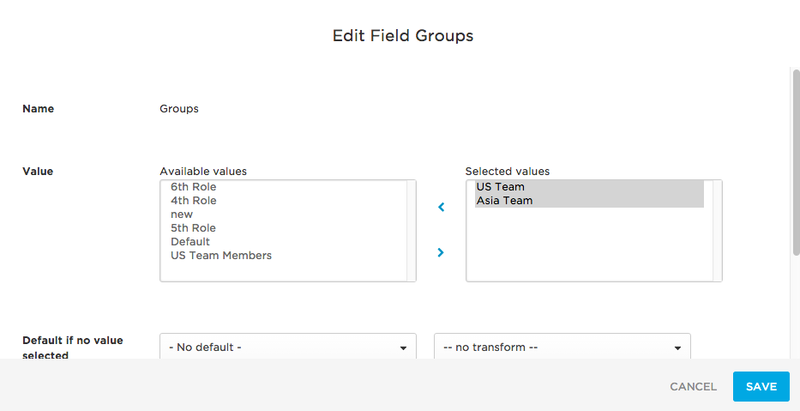 To do this, click the Groups parameter row and move the Slack user groups to which you want to provision users from the Available values column to the Selected values column. This configuration will provision all of your users to each of the selected Groups. Note: To have your Slack user groups display as available values when configuring provisioning, you must first refresh entitlements. To do this, in your Slack app, go to the Provisioning tab and click Refresh. Scroll down to select the Include in user provisioning option and click Save. If you want to provision subsets of your users to one or more existing or new Slack user groups, configure provisioning using the Groups parameter and rules. See Using Rules to Provision Users to Slack User Groups. If you do not want to provision to groups, be sure to leave the Include in User Provisioning option shown above clear. 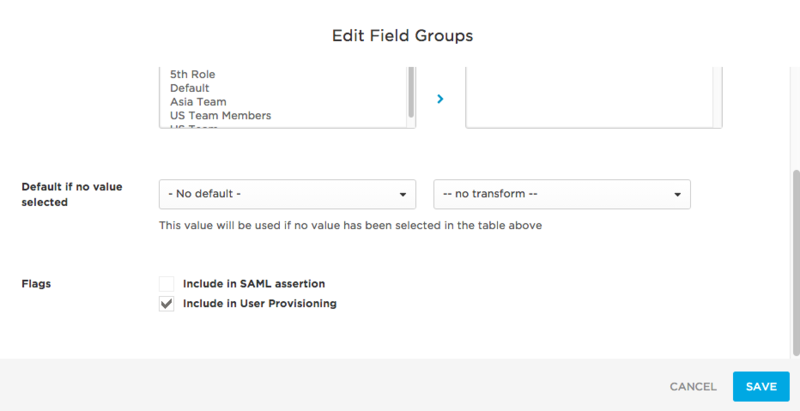 The NameID (Subject) field is used for SAML SSO. See Configuring SAML SSO for Slack. For SCIM Username, leave Value set to Email. While you can use a macro or another value here, Slack does an excellent job of parsing email values into usernames so we recommend that you set Value to Email. You can define rules to provision subsets of your OneLogin users into Slack user groups. For example, you can define a subset of users by filtering on a specific OneLogin user attribute value and then define an action that provisions the subset of users to a specific Slack user group. Go to Apps > Company Apps. Search for and select your Slack app. 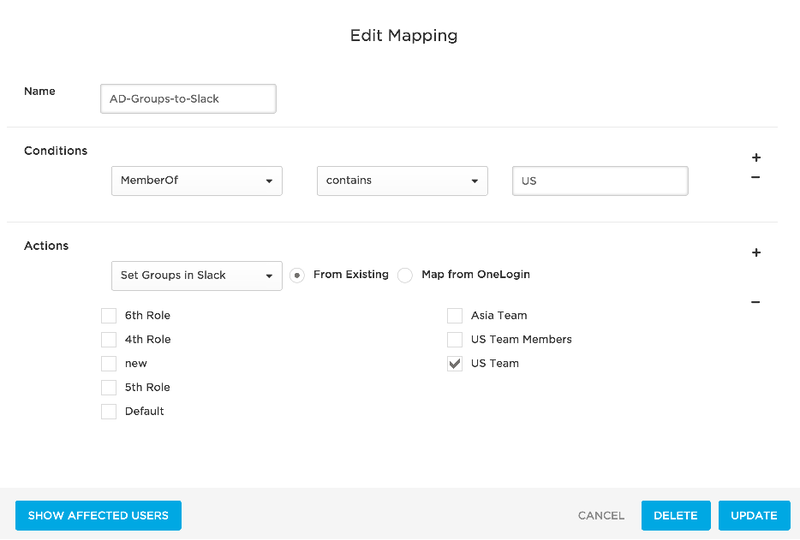 Click New rule to open the New Mapping dialog, where you can set the conditions and actions that determine which users will be provisioned from from OneLogin to specific Slack user groups. For use cases like this one in which you are provisioning users to new Slack user groups, no conditions need to be set. All settings are configured in the Actions area. In the first drop-down, select Set Groups in Slack App Name to provision OneLogin users to user groups in Slack. 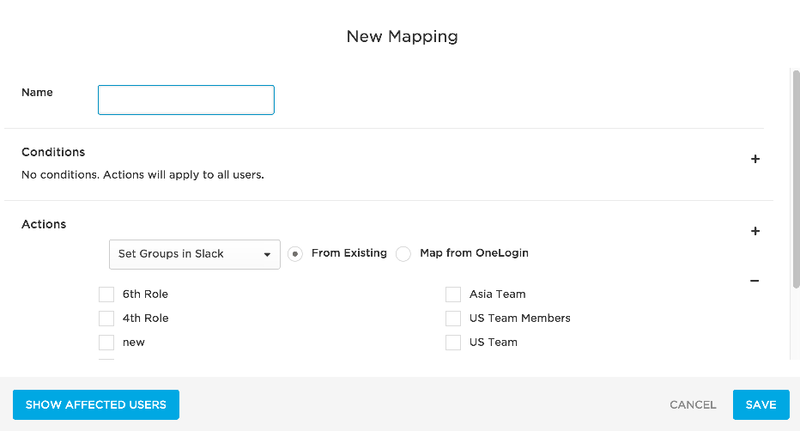 Select the Map from OneLogin option to provision users to new Slack user groups created based on information in OneLogin. Select a For each value of memberOf to provision users to Slack based on their member_of user attribute value. To identify the AD/LDAP security groups that will be used to create user groups in Slack and provision users to them, provide a regular expression (regex) in the adjacent field. Provisioning will parse through AD/LDAP security group data and apply the regex. For each matching value, a user group will be created in Slack. Any users who are members of a matching AD/LDAP security group in OneLogin will be provisioned to the newly created user group in Slack. Use the two adjacent fields to write a condition to select the AD/LDAP security groups that contain the users that you want to provision to Slack. In the first drop-down, select Set Groups in Slack App Name to provision users in the selected AD/LDAP security groups. Select the From Existing option to provision users to an existing Slack user group. Select the existing Slack user group to which you want to provision the users who are members of the selected AD/LDAP security group. If you selected a subset of Slack user groups on the Parameters tab as discussed in Mapping Slack Attributes to OneLogin Attributes, only that subset of user groups will be selectable here. This rule will take all firstname user attribute values that begin with J and create matching user groups in Slack and provision users to them. In this case, provisioning will create user groups in Slack for Jennifer, John, Jonathan, and Joshua. Users with the selected firstname values would then be provisioned to their matching user groups in Slack. For most organizations, this rule would result in less-than-useful Slack user group creation and user provisioning. 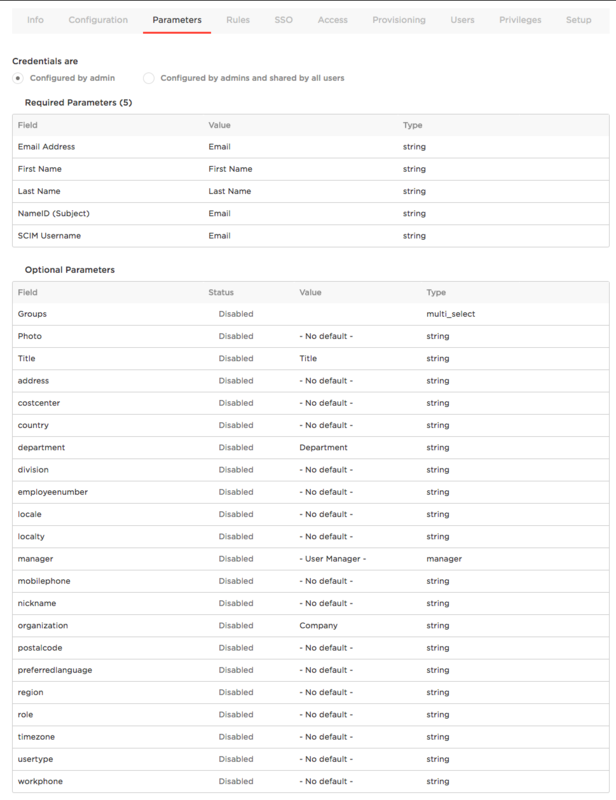 Test your provisioning setup to confirm that provisioning from OneLogin to Slack is working. Create a test role and add your Slack app to it. Click Save. This will trigger provisioning of the test user to your Slack app. When the user has been successfully provisioned according to OneLogin, go to Slack and confirm that the new user has been added. If you used the Slack SAML connector to add the SAML app to your OneLogin App Catalog before Sept 9, 2016, you were required to use a SCIM bearer token to authenticate to the Slack SCIM API. 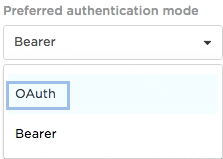 But now Slack lets you use OAuth 2.0 authentication without having to use a SCIM bearer token. Pure OAuth authentication is more secure, and you should switch your Slack API connection to use OAuth only. Go to Apps > Company Apps and select your Slack app. On the Configuration tab, click the Disable button to disconnect from the Slack SCIM API. Select OAuth from the Preferred authentication mode drop-down. Go back to the Configuration tab and click the Slack OAuth Authenticate button. Click the link on the Complete Authentication Process dialog that pops up, and follow the prompts to authenticate to the Slack SCIM API over OAuth 2.0. Your Slack credentials should have permissions to read and write to your company Slack account using the Slack SCIM API. When the connection to the Slack SCIM API is complete, the Authenticate button will turn into a Clear Token button. You can click this any time you want to reauthenticate to the API.